Eagle-eyed readers will say we’ve been here before; and so we have, for I reviewed a 6-CD box of Svetlanov’s Rimsky back in 2009. That set, issued by the conductor’s widow Nina-Nikolaeva Svetlanova, is pretty comprehensive; indeed, it contains many of Rimsky’s slighter works, some performances of which are recommendable and others not. The four CDs in this new Melodiya box are presented in sturdy sleeves, which is a great improvement on the cantilevered jewel case of the earlier set that pinched and unseated discs at the slightest provocation. The sound of those CDs was poor to good, so I hoped these re-masters would improve on that. CD1 is a straight duplication of the first two symphonies found in the earlier box. I was generally complimentary then, although I don’t feel quite so generous this time around. These are decent performances, but anyone hoping for better sound will be disappointed. There’s a fatiguing edge to the tuttis and there’s not much depth to the soundstage. As for Antar it’s not quite as distant as I remember it and there also seems to be a little more bite to the typically rude Russian brass. As I mentioned in my initial review Svetlanov certainly propels the music well; more important, he does so without ever sounding harried. That’s also true of the revised Symphony No. 3, which opens CD2. The levels aren’t as low as those in Antar, and there’s a pleasing degree of warmth and detail here that’s missing from the previous disc. I liked Svetlanov’s way with the piece even more this time, for it has a colour and cogency that didn’t strike me so forcefully in the earlier set. That said, Soviet engineering was rather crude, hence the overloaded climaxes. It’s not enough to dilute one’s enjoyment of the music, though. Happily the Sinfonietta, based on the composer’s string quartet of 1878, is played and recorded with rather more refinement. 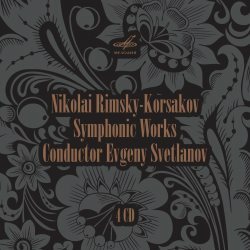 As I remarked in my first review Svetlanov’s Rimsky has its fair share of disappointments, although the Sadko tableau on CD3 isn’t one of them. The piece has plenty of thrust and a real sense of drama; the playing is rhythmically alert and despite some absurdly exaggerated balances – the flutes shriek like banshees and the bass drum is overpowering - it’s a most entertaining performance. Next in the order of composition – and play – is the stomping Fantasia on Serbian Themes, which finds orchestra and conductor in flamboyant form. Fairy Tale, not included in that earlier box, is a gorgeous tone poem that boasts fine detail and some delectable woodwind playing. As for Svetlanov’s Capriccio espagnol I felt it uninspired then and still do so now. I have no qualms about his Scheherazade, which introduces CD4. It’s as refreshingly direct as I remember it, and it’s full of character and nuance too. The violin solos are seductive and sensibly balanced and there’s a narrative strength here that makes this one of the most successful and enduring versions of these Arabian tales in the catalogue. The engineering is good too, with decent balances and a deep, velvety sound that seems entirely right for this most exotic and alluring of works. Not even the constricted climaxes can undermine my affection for what is clearly a passionate and heartfelt account of this showpiece. Indeed, I wouldn’t mind being shipwrecked and stranded on a desert isle with this one in my steamer trunk. Ditto Svetlanov’s highly charged account of the Russian Easter Festival Overture. However, it doesn’t quite supplant the Kees Bakels/Malaysian Philharmonic version on BIS; apart from splendid playing the latter has the advantage of demonstration-quality sound. That said, the Melodiya team have excelled themselves here; the ecstatic percussion is superbly caught and those great epiphanies expand naturally and without audible stress. Is it any wonder that the last two items in the set, the Opp. 61 and 62, pale into significance after that? If you already own the earlier 6-CD set there’s no earthly reason to invest in this one; it certainly doesn’t offer better sonics. Newcomers to this repertoire may be tempted by the price – around £20 – but unless you absolutely must have Svetlanov the Bakels box at roughly the same price would be my first choice; indeed, it’s one of the glories of the BIS catalogue. Svetlanov groupies will want this set; Rimsky fans might want to look elsewhere.